I started this drawing early last year, and worked on it off and on for the longest time. I wasn't sure how to finish it, originally the cranes were to be red. 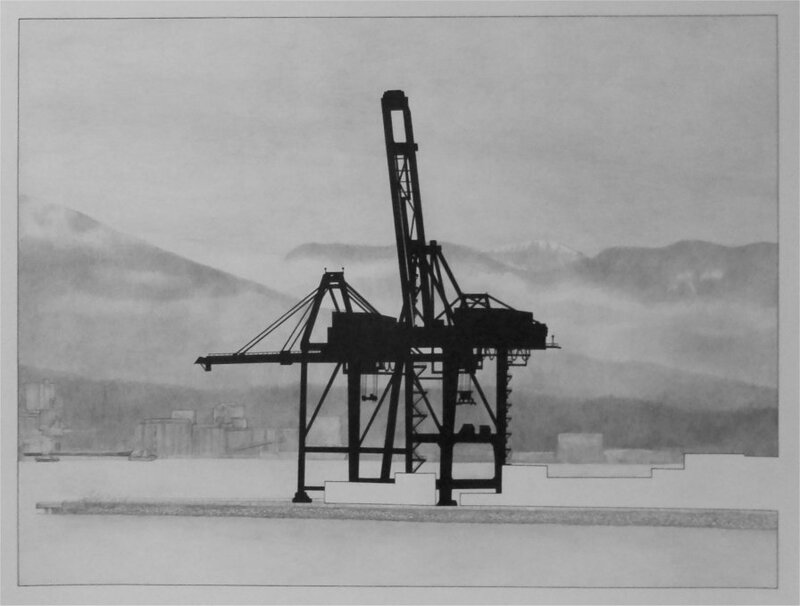 I finally decided to draw the cranes as black silhouettes, like a shadow-puppet show, and the shapes of the unloaded containers as blank white spaces. Although I have always been impressed with the engineering of these massive cranes - the two shown are much larger than the earlier models in my previous drawings - the cranes are economic soldiers of the Chinese economy, not ours. We are turning northern Canada into a resource extraction wasteland in order to ship raw materials offshore that return in millions of containers as crappy cutlery, stupid little knicknacks made with exotic woods plundered from rapidly disappearing forests, tools that break on first use because they copy Western designs but not the required engineering, clothes that fall apart on first wash ... all of it at stupidly low prices that put Canadian businesses out of business. Accordingly, I decided to visualize these cranes as alienated from their surroundings, separate, alone, and without friends. The North Shore mountains in the distance don't seem to mind, but in China you wouldn't be able to see them at all through the smog and pollution. The drawing is archivally matted in Crescent 1607 4-ply matte, in an OPUS metal exhibition frame. The image is drawn with archival pigment ink and HB pencil on a 22" by 30" sheet of acid-free BFK RIVES 100% cotton print paper made in France.